The Department of Operational Support (DOS) is working towards the Sustainable Development Goals and wishes support UN Secretariat entities to lead by example in the countries they operate. UNAMID/Albert Gonzalez FarranA UNAMID military member from Nepal commemorates the World Environment Day planting a tree at the UNAMID headquarters in El Fasher, Sudan. 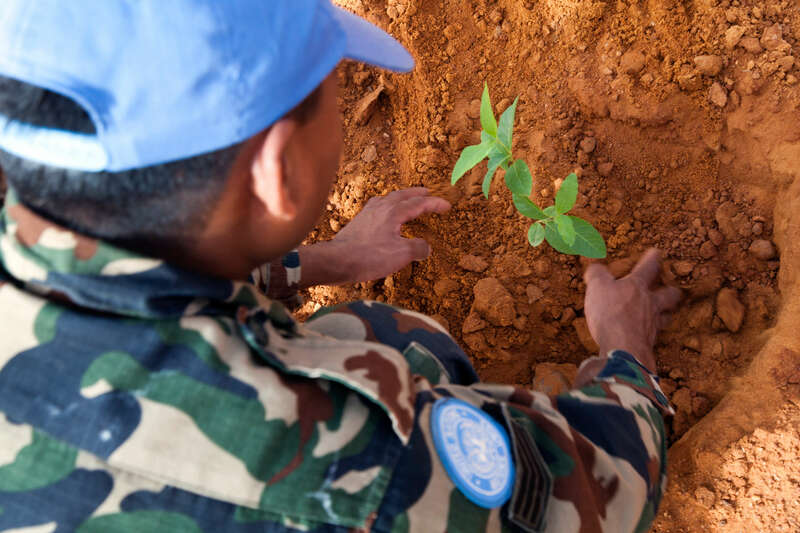 Since June 2009, UN Peacekeeping and the Environment Team in DOS have had a dedicated Environmental Policy for UN field missions. It covers key areas such as waste, energy, water, hazardous substances, wild animals and plants as well as cultural and historical resources management. However, acknowledging that the implementation of this Policy was overall weak and varied from mission to mission, the team increased its focus on environmental management in 2015, establishing it as one of the top priorities. In September 2015, a dedicated Waste Management Policy for UN Field Missions was approved. With the support of UN Environment, we have created an Environmental Performance Management System, focusing on both risk assessment and positive performance in the following areas: Energy, Water and Wastewater, Waste, Wider impact and Environmental Management System. For more information on the 2016 Environment Strategy, please refer to its Executive Summary and its latest Progress Update. Member States have strengthened their emphasis on environmental management in recent years, while both internal and external audits from 2014 to 2016 demonstrate that there is a long way to go to ensure consistently high performance across the board. While the General Assembly “requests the Secretary-General to continue his efforts to reduce the overall environmental footprint of each peacekeeping mission”, the UN Security Council has also taken a strong stand on the issue by requesting different field missions “to consider the environmental impacts of its operations when fulfilling its mandated tasks and, in this context, to manage them”. The following missions are or have been mandated in this regard: MINUSMA (since its creation in 2013), UNSOS, UNAMID, MONUSCO and MINUSCA. On 21 December 2017, the UN Security Council released its first press statement on environmental management of peacekeeping operations. Member States have also requested all peacekeeping operations to report annually on an ‘environmental scorecard’ related to their respective performance in this area – including an indication of any risk and steps that are being taken to address it. In 2017, under the impetus of Bangladesh and Italy, the “Group of Friends for leading on environmental management in the field” was created. It serves the purpose of supporting the implementation of the environmental strategy for field missions. More generally, it aims at raising awareness and focusing discussion and mandates on the importance for the United Nations to manage its environmental footprint in the field as a relevant enabler of better mandate delivery.